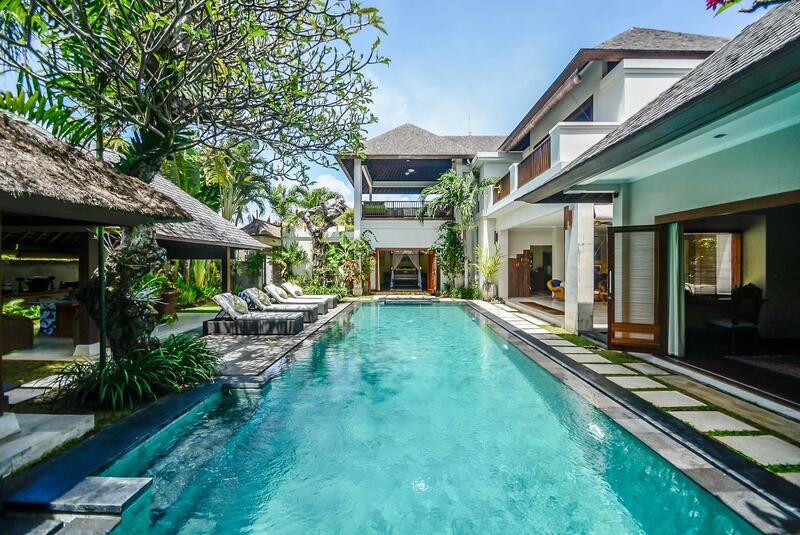 Securely sited within Seminyak’s exclusive Laksmana Estate, just moments from the beach, the fully staffed three-bedroom Luxury Seminyak Villa is a rhapsody of contemporary and traditional Bali-style architecture set around a 17-metre pool. Its stunning interiors combine museum-quality antiques and artefacts with 21st Century technology to create a villa designed for easy living and lavish entertainment. With a huge living pavilion, dining balé, sun deck, rooftop terrace, gym, home office and super-pro kitchen with separate wine cellar, there’s space for six to spread out in supreme comfort. 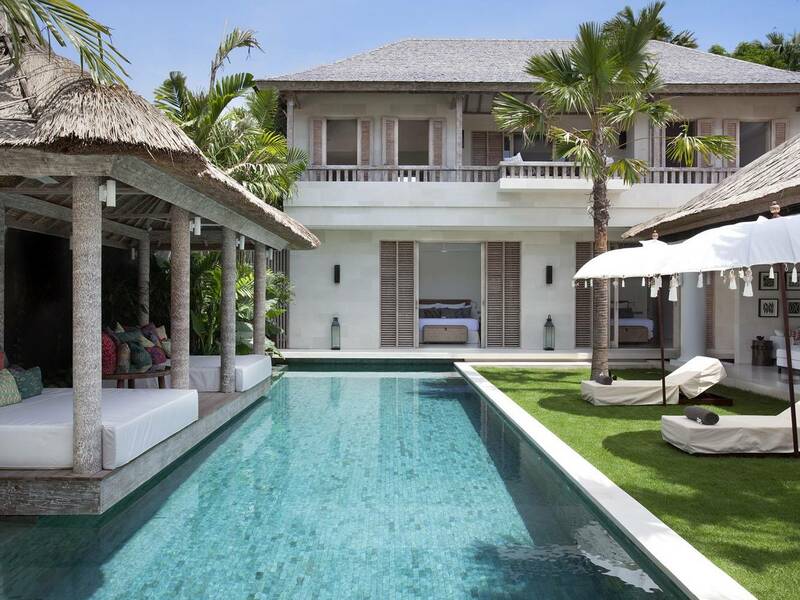 The villa blends the best of contemporary and traditional Bali design elements in a prime champagne-popping Seminyak location moments from Petitenget Beach. 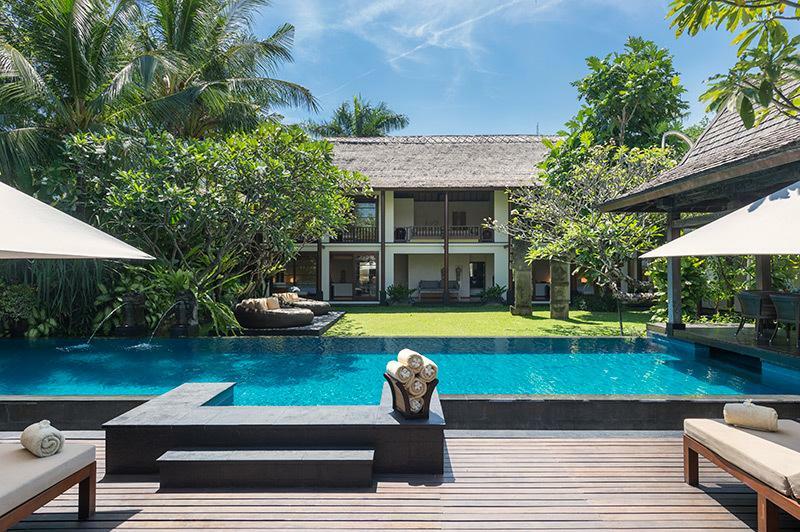 Featured in many lifestyle magazines, this paean to laid-back tropical living was created by Bali-based Dutch architect Joost Van Grieken as a stunning holiday retreat for its sociable, style-conscious owner. 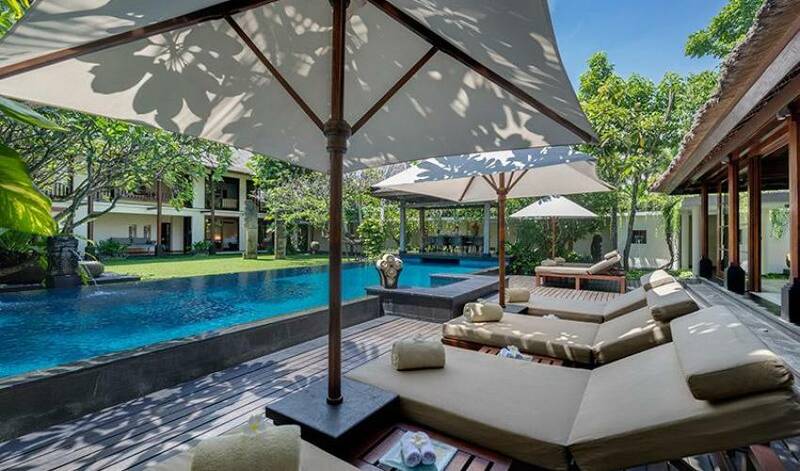 For a three-bedroom villa, the understated yet uber-chic Villa is incomparable. 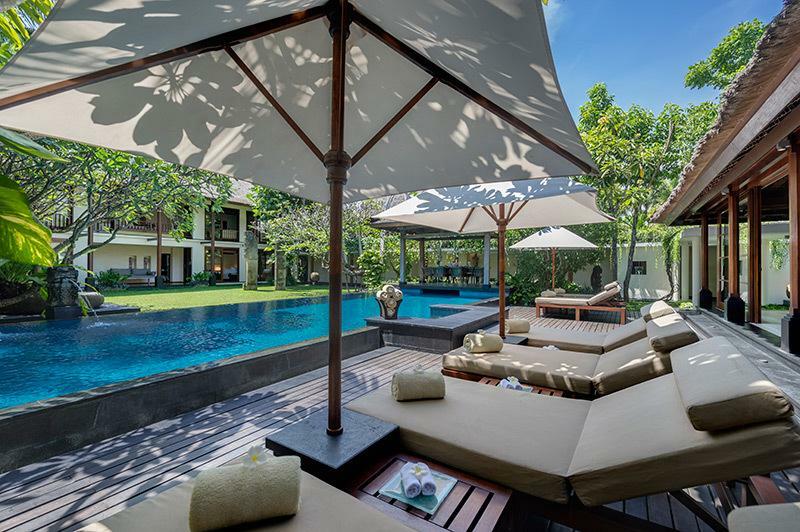 Think spacious vaulted living pavilion, multiple dining areas, glamorous bedrooms, Philippe Starck bathrooms, and gorgeous statue-graced garden with 17-metre pool, antique balé, ornamental ponds and rooftop terrace. 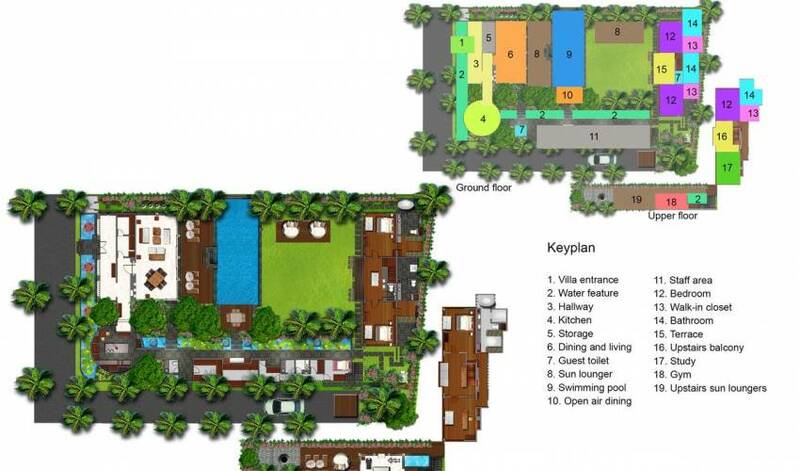 Add an air-conditioned gym, temperature-controlled wine room, dedicated music control room with centralised iPad-controlled Bose sound system, home office with iMac, Apple TVs, and iPods in every room. 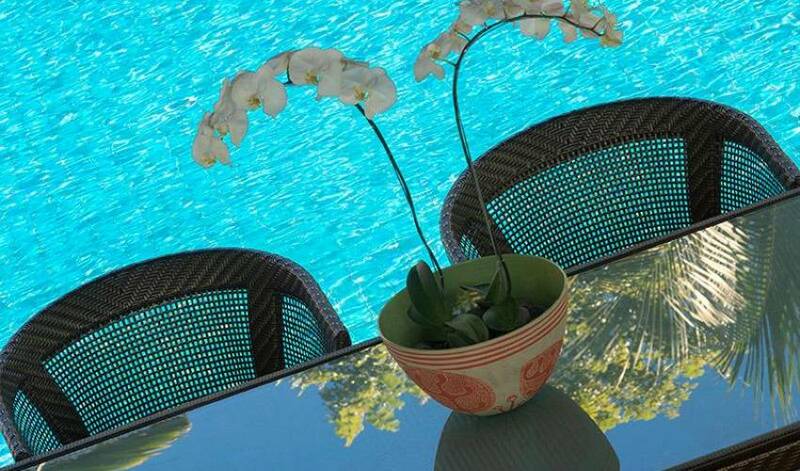 Enrich with an extraordinary collection of museum-worthy antiques and artefacts from Bali, Sumba, Nias and beyond. And finally animate these luxurious surroundings with turquoise-attired butlers on hand 24 hours a day, and an accomplished chef who can whip up feasts from an appealing suggestion menu, served in air-conditioned cool, or candle-lit alfresco charm. It couldn’t get any better! 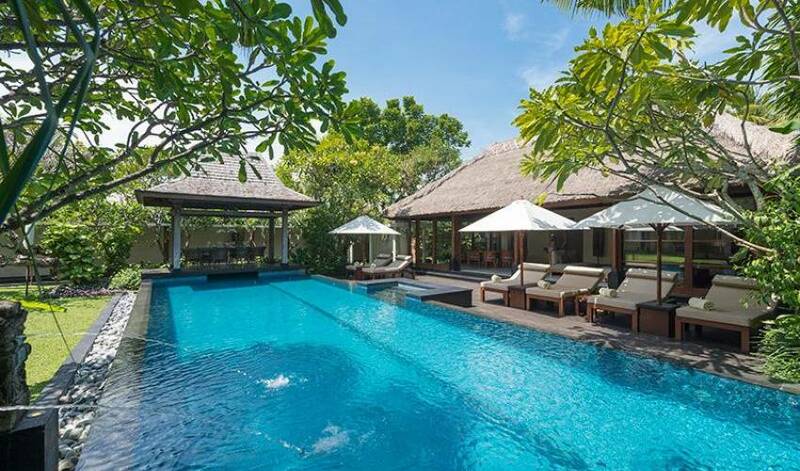 The Villa is named after the legendary brother of Laksmana, both heroes of the revered Hindu epic the Ramayana. 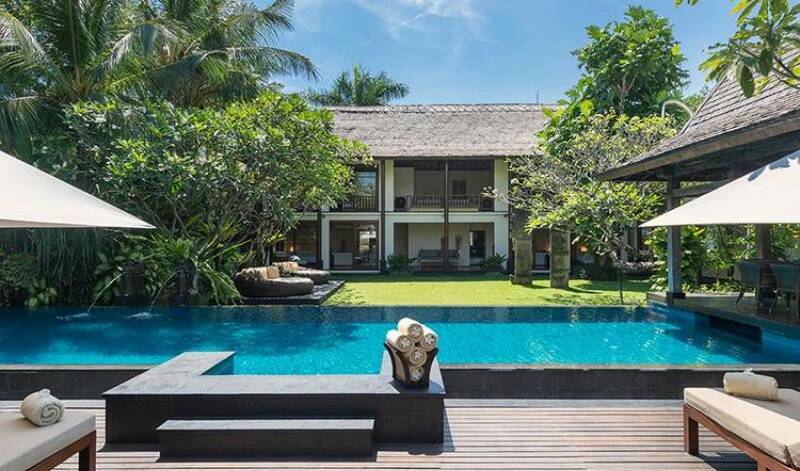 The villa rests within the exclusive Laksmana Estate in the heart of Seminyak, a short walk from Ku De Ta, La Lucciola, Potato Head and Bali’s famed surf-and-sunset beaches. 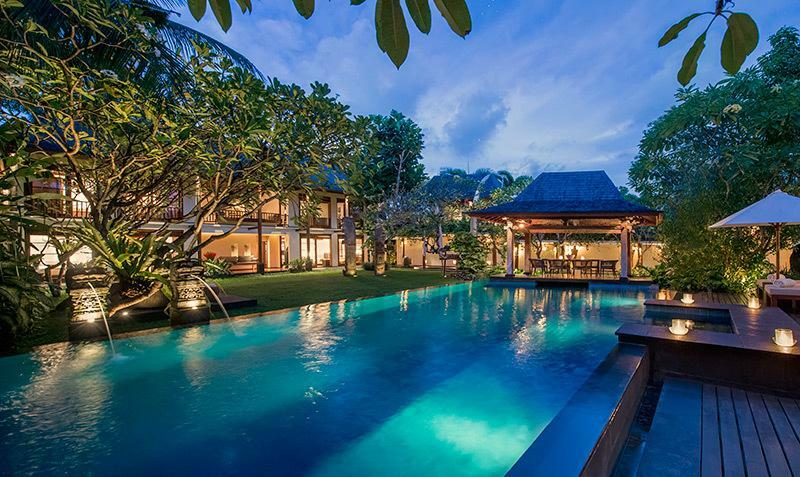 It’s the perfect villa for fun-loving friends or a family who relish luxurious, hedonistic surroundings a heartbeat from Bali’s most happening places. 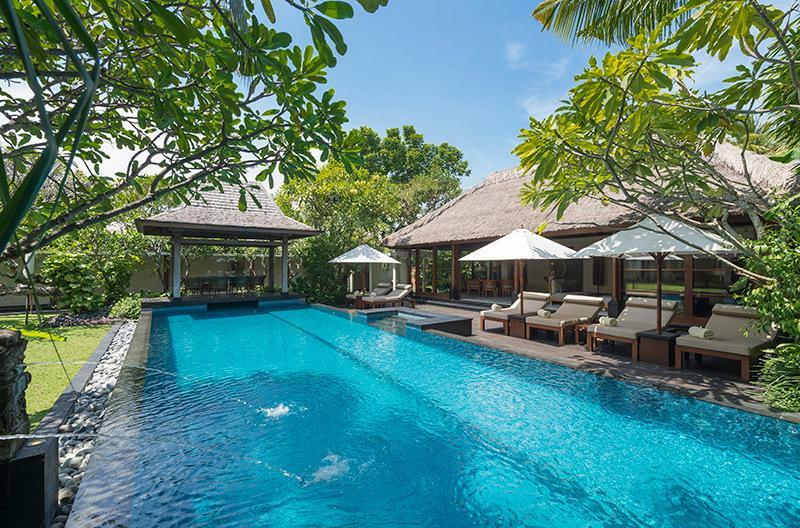 Within the villa’s large garden, two thatched pavilions face each other across the 17-metre swimming pool, sun deck and lawn. Furthest form the entrance is the two-storey bedroom pavilion, where a pair of guest suites open onto the lawn and, above, an open terrace separates the large master suite from an office/reading room. From here, a pond-lined colonnade – with air-conditioned gym and rooftop terrace above – leads to the professional kitchen and the living and dining pavilion. Behind, off a semi-open gallery that links to the villa’s entrance, is a temperature-controlled wine room. 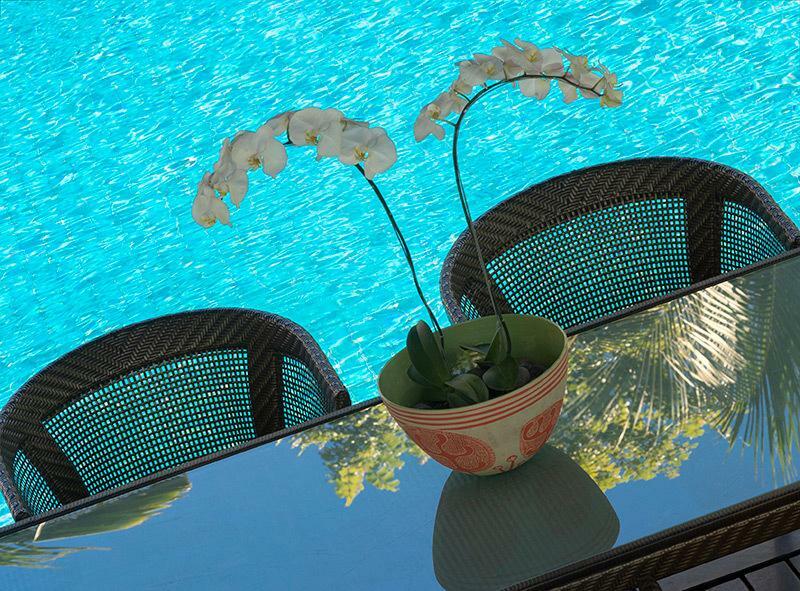 Designed for entertaining in style, the huge living and dining pavilion is the villa’s social hub. Striking antique statues and artefacts surround deep-cushioned sofas and a dining table seating eight in supreme comfort. Below the vaulted alang-alang thatched ceiling, the white stone floor flows towards the ironwood deck beyond walls of sliding glass doors that can be closed for air-conditioned cool or flung open for breezy tropical living. 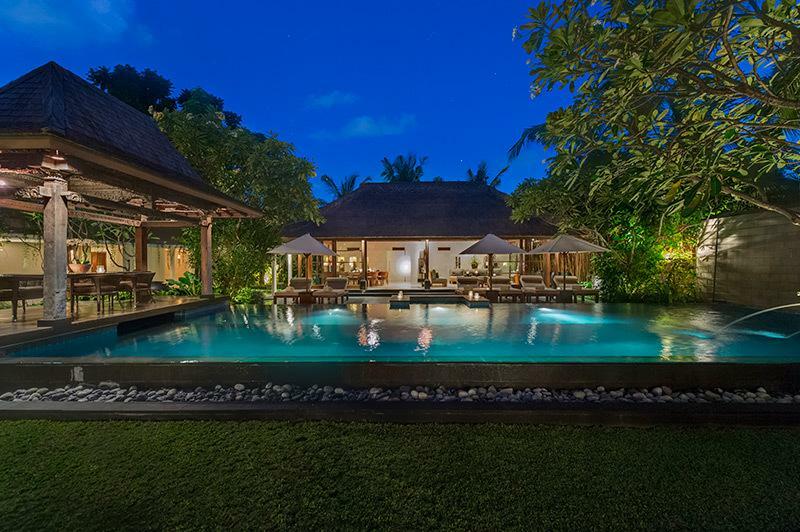 This Luxury Seminyak Villa sits securely within the prestigious Laksmana Estate in the heart of Seminyak’s Golden Triangle. A five-minute walk away is Pettitenget Beach, renowned for its spectacular surf breaks; the beach stretches for kilometres in either direction – southwards to the popular beaches of Seminyak, Legian and Kuta and northwards to Batubelig, Canggu and beyond. La Lucciola is only moments away, and Ku De Ta, Sarong and other much-lauded restaurants and bars are within easy walking distance. 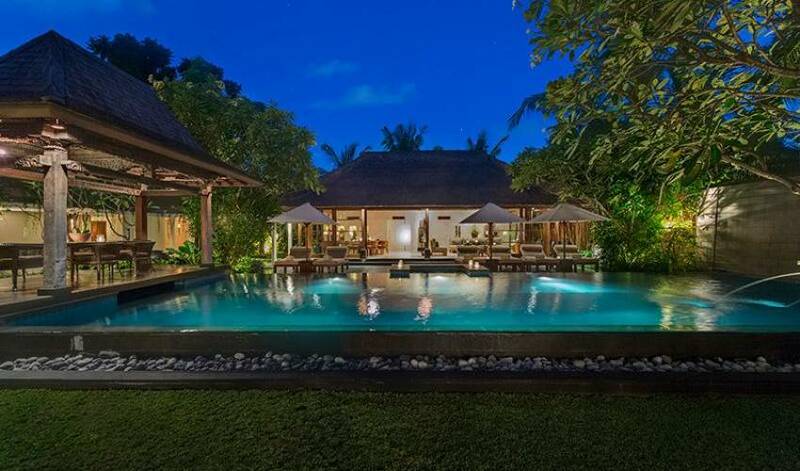 Villa guests are also well placed to enjoy the boutiques and spas of Seminyak without the need for transport.